I arrived in Sterling CO last night at about 5:30. Vicki, my cousin from Bremerton WA, and John, her husband, were already there. They were with some cousins from the area that I had not met. It was taking a little longer than I expected to arrive because I was lost for about 40 minutes in Denver. Somehow, I missed the same turn six times from four different directions. This would seem to defy the laws of physics, geometry, or basic human intelligence, but I was convinced I could get through Denver without looking at the map. Then, once I looked at the map, I had no idea where I was. When I finally arrived in town, Vicki told me to come to the library on the town square. When I drove up, Vicki and John were waiting outside. They ushered me into the library where about 18 or so relatives, by blood or marriage, were gathered. Russ and Cindy, two of the relatives, had recently turned over the family farm to Matt, their son, and moved into the building, which had been a library, then a bed and breakfast, and now a home. Russ and Cindy have a lot of beautiful bookcases. In the group were also Karol and Joann, two more cousins I had never met. I am related to the other people in the room by marriage. Before this gets too confusing, I should explain a little family history. Peter Jensen, my great-grandfather, emigrated from Denmark with his entire family in 1884. They eventually homesteaded in Deuel County, just over the border in Nebraska. Henry, my grandfather, married Musa Polley. The Polley family owned, a number of hotels in the area, including the Pioneer Hotel in Julesburg CO. The Jensens married into a number of other families in the area—Jurgensen, Peterson, Sowder, Johnson, and Jacobson. Of the entire group, my two sons and I are the only ones who carry the Jensen name. Henry and Musa, my grandparents, moved to Vaughn WA around 1911 (a rough date), where my father was born. My father joined the Navy, served in most of the major sea battled in the Pacific during WWII, met my mother, who was working with the Red Cross, and eventually settled in Virginia Beach in 1956. So, Vicki, my first-cousin, grew up on the west coast. I grew up on the east coast. We didn’t meet until we were both about 30 years old. Neither of us had met any of the relatives in the Colorado area until relatively recently. Vicki met some of them through the mail when she was doing a genealogy of the family. When I made a trip to the west in 1993, I met two of these cousins, Lloyd Peterson (whos has since passed away) and Cindy Sowder, who weren’t in this group. That’s probably enough. This is starting to sound like one of those “begat” sections of the Old Testament. After we talked for a while, Russ handed me a framed document, dated December 6, 1890. The document announced the citizenship of Peter Jensen, my great-grandfather. Russ told me he wanted me to have it, so it would be passed down through the Jensen side. It was an amazingly generous act from a cousin I had met about twenty minutes earlier. The next day, Vicki, John, and I visited the Fort Sedgwick Historical Society and the Depot Museum in Julesburg. Mary, the archivist, opened both facilities just for us, on her day off. We then drove around looking for the Polley homestead, which we think we found, the Jensen homestead, which we were near but couldn’t quite find. We also looked at the Polley hotel in Bruhl, which is abandoned (Vicki likes to have momentos of these spots, so I unscrewed a door hinge with a dime, while she blocked the view and John kept the motor running in the car), and the Pioneer Hotel in Julesburg. All along the trip, we shared what we knew about family history. We met Russ and Cindy for dinner and spend sometime after dinner visiting Russ’s accounting office and chatting in their library/home. It’s been a great day. Tomorrow I start to drive toward Yellowstone. George ,It sounds like you are having a wonderful trip–Lenny and I are following you every step of the way. 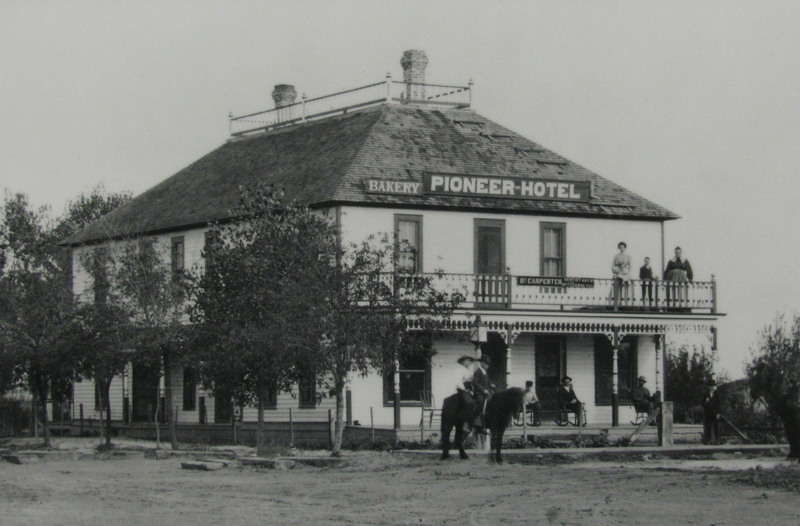 My family also owned the Pioneer Hotel… I think after your family did. Susan M Harrison. Do you by chance have an address for the hotel in Julesburg? My family also includes Johnosn and Sowder…..What an exciting find…and it sounds like you have an amazing extended family. Nice to meet you. I don’t know the address. The historical society in Julesburg would know, I am sure. They aren’t open many hours, but they do have someone who answers questions like this. I will also ask Vicki Jensen Bushnell, my first-cousin, who has done a lot of work on family history. We must be related in some way. Did you know about Russell Johnson’s passing? unfortunately, our Johson’s are not related. My gggrandfather Alonzo Johnson was murdered in JBG over a land claim in 1890. different family of Johnsons. Related to the John Franklin Sowder family through Alonzo’s wife Margaret Ann, who married Mr Sowder after Alonzo’s death. Alonzo’s sister was Susan Harrison, proprietor of the Pioneer Hotel around 1899-? Are you by chance related to Alma Jensen Sowder? She married Alvin Thad Sowder. I have a copy of the History of Sedgwick county..if you or Vicki would like information from the book, I would be glad to send you a copy of the pages. There are a lot of Johnson names and a small bit about Alma Jensen Sowder and a bit about the Sowder family. A good picture of the Pioneer Hotel but undated. We were just at Julesburg but got conflicting information about where the Pioneer Hotel stood or stands. We tried to locate it but it was getting dark, so it was difficult to see.